New Delhi: Union government, Himachal Pradesh and other five states viz. Delhi, Haryana, Rajasthan, UP, Uttarakhand signed a pact in New Delhi for the construction of Rs. 3966.51 crore Lakhwar Multi-Purpose project in the Upper Yamuna Basin. 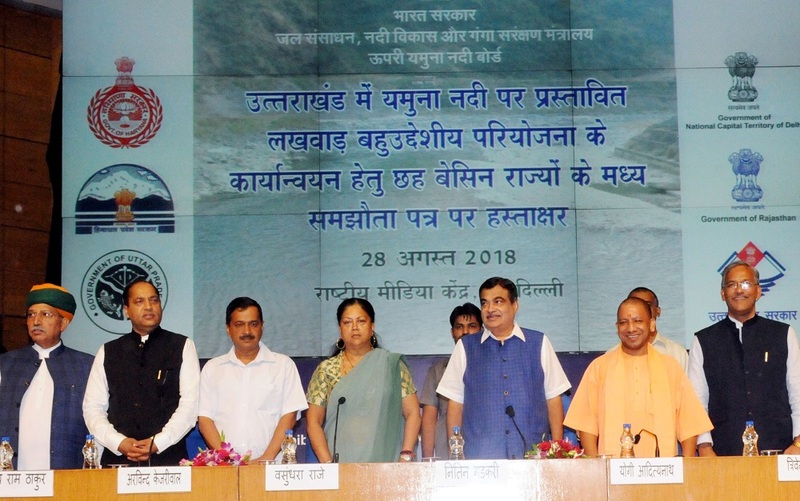 Chief Ministers of six States including Delhi, Haryana, Rajasthan, UP, Uttarakhand and Himachal Pradesh signed the MoU in presence of Nitin Gadkari, Union Minister for Road Transport and Highways, Shipping and Water Resources, River Development and Ganga Rejuvenation. The Lakhwar MPP envisages constriction of 204 metre high dam across river Yamuna with live storage capacity of 330 million cubic metre (MCM) and generation of 330 MW of power. The project benefits include, supply of 79 MCM of clean drinking water which would go a long way in solving the water scarcity issues in the six states, 65 percent increase in non-monsoon flows in Yamuna River and bring additional 34,000 hectares under irrigation. Govt. of India will bear 90 percent cost of the water component project and the rest 10 percent of the water component would be borne by States in the ratio of water allocated to them as per water sharing MoU of 12.05. 1994. The cost of power component of the project would be borne by Uttarakhand and they will avail the benefits of the power generation. The project would be constructed by Uttarakhand Government within 54 months and project work would be monitored by Upper Yamuna River Board. Himachal Pradesh would receive 3.15 percent of water as its share. Uttarakhand government will borne Rs. 1388.28 crore of the project and remaining cost of Rs. 2578.23 crore which form the irrigation and drinking water components, 90% will be borne by the Centre (Rs. 2320.41 crore) and 10% will be divided between the States of Haryana -Rs.123.29 crore (47.82%), Uttar Pradesh/ Uttarakhand -Rs. 86.75 crore (33.65%), Rajasthan-Rs. 24.08 crore (9.34%), NCT Delhi -Rs. 15.58 crore (6.04%) and Himachal Pradesh -Rs. 8.13 crore (3.15%). Total three major storage projects are proposed to be constructed on the river Yamuna and its tributaries, Tons and Giri in the territories of Uttarakhand and Himachal Pradesh, namely Lakhwar MPP with 330 MCM live storage and 300 MW power generation on Tons river and Renukaji Project in Himachal Pradesh with 498 MCM live storage and 40 MW power generation on Giri river. Union Minister said the project will also help to control pollution in River Yamuna under Clean Ganga Mission. Gadkari said that 34 projects are being taken up on the river out of which 12 are in Delhi which will ensure that the water going to Haryana and Rajasthan is pollution free. While Lakhwar project will provide adequate water to all six States, the interventions being made under Namami Gange programme will ensure pollution abatement in Yamuna serving the twin purpose. Gadkari said the problem is not water shortage but water management and the Government is taking steps in this direction. He added that Lakhwar project will not only ensure water availability but also improve irrigation, generate electricity and fulfil the drinking water needs of all six States. Besides Lakhwar Multi-Purpose project, there are two other major projects being envisaged in the Upper Yamuna reaches which are Kishau Multi-Purpose project and Renukaji Multi-Purpose project. A fourth project is the Vyasi project, a run-of-the-river scheme under which a concrete dam across River Yamuna is being constructed near Vyasi village in Dehradun district. The Vyasi project is scheduled for commissioning by December 2018.